REVELL HAS PRODUCED A 1:24 SCALE KIT of this most famous of German cars for many years. However, this latest kit is a brand-new updated version, with more detail and accuracy than the earlier offering. Mat Irvine: The new Revell Volkswagen Beetle Limousine kit represents a 1968 model-year car, though the basic style and design lasted for many years. The kit features a full interior, a detailed air-cooled engine for the rear, with an opening engine hatch. There’s also an opening boot lid in front, though the interior is oddly bare - there should be at least a spare wheel inside. However, the four main wheels rotate, the tyres are of thin vinyl, and many parts are chrome plated, such as the tiny front grilles, front and rear indicator and lamp housings. Parts layout (below). Note alternative dashboards are supplied (bottom left). There is a multi-piece interior with separate side-panels, individual front seats and rear bench. Small details, such as the roof-mounted grab handles and the classic dashboard flower vase, are included. A new feature is that you get both left- and right-hand drive dashboards. The only licence plate included for a right-hand drive (RHD) country is the UK, but you could likely source plates for other RHD countries, such as Ireland, Australia, South Africa, New Zealand, Japan. A neat extra component is a tow hitch, correctly installed under the engine, and attached to the rear of the chassis pan. Note that the scalpel (above, below) is not pointing to mould lines. They indicate where body panels join on the real thing, so should not be sanded away. The running boards on either side (below) are chromed, so you will need to mask off the outer chrome strip, and paint the rest satin black. The front boot lid (below) is removable, though no spare wheel has been supplied for the inside. Rear hatch (below) opens to reveal the air-cooled engine. Body removed (below) showing details of the interior and engine. The pale moulded plastic of the body components makes any choice of final colour a straightforward paint job. For this build (below) I chose the bright-red ‘star car’ from the 1984 movie Gremlins, as driven by the main human character, Billy Peltzer, played by Zach Galligan. I modified Billy from a figure supplied in the Tamiya ‘Campus Friends’ set. Actually, the car actually doesn’t appear in the movie much and when it does, it is either not moving or is covered in snow - or both. My choice was prompted by the diecast version from the specialist company Greenlight, which comes complete with Gizmo, the strange creature that spawns the gremlins of the movie name. Greenlight appears to have had the same problem I had, though, which is that no one seems to know what the licence plate reads, as the only time it is seen, it’s covered in snow. This is how the snow-covered car appeared in Gremlins. New and old Revell Beetle bodies compared (below). New kit (below left) has opening front boot, old kit an open sunroof. 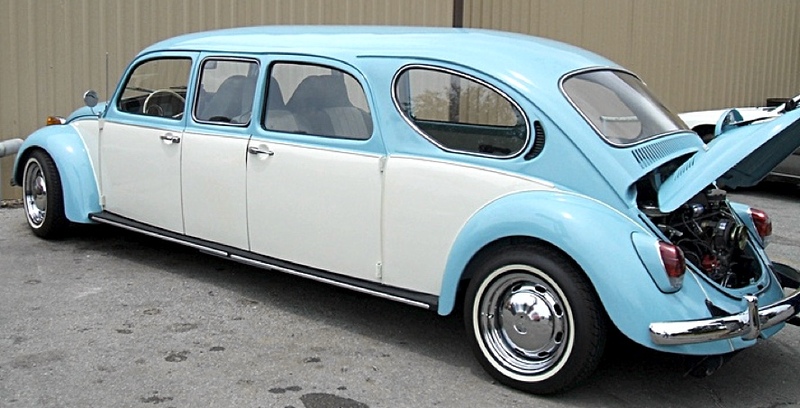 The older version has also been issued as the VW that starred in the 1968 Disney movie The Love Bug. But a second kit, the 1970 Cabriolet (convertible) version (below) is based on the same parts, though with a different tooling for the bodywork, and other subtle changes, such as newer bumpers with recesses. SMN note: Calling this a Beetle ‘Limousine’ seems an odd decision by Revell. The car is really a sedan or saloon. You need a super-stretch bug to be worthy of the limo title (above, below). In fact, a stretch version could make a really interesting scratch-build conversion,. Perhaps Revell could make one as another new kit.